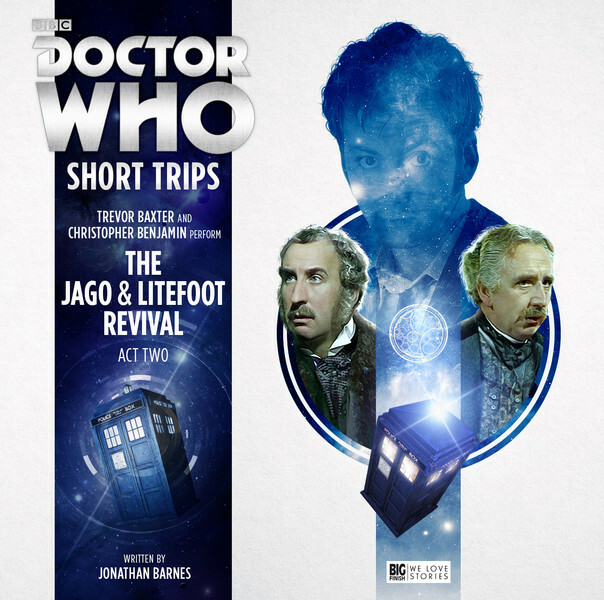 Big Finish: Doctor Who - The Jago & Litefoot Revival, Act 2 Review | Warped Factor - Words in the Key of Geek. Tony’s got the right oopazooticks. At the end of Act 1 of Big Finish’s two-act Short Trip bringing Jago, Litefoot and the Tenth Doctor together – or at the very least, Litefoot and the Tenth Doctor together – we were treated to an extra surprise, as, while George Litefoot was running away from a bunch of spectral cowboys on the Greek Island of Minos in the company of He Who Makes Machines That Go Ding, back in London at the New Regency theatre, Henry Gordon Jago was trapped in a basement with a juggler! No…wait, hang on, let’s have another go at that. Dooby dooby dooby, New Regency theatre, Henry Gordon Jago was trapped in a basement with a giant scuttly thing from outer space! Yes, that’s more like it. What Act 2 of The Jago & Litefoot Revival makes clear very quickly is that if there’s one thing you never trap in a basement with a giant scuttly thing from outer space, it’s Henry Gordon Jago. While Litefoot’s storyline of The Gentlemen of the Dice – a great, esoteric-as-all-hell creation from writer Jonathan Barnes – chasing him all over Minos for reasons not entirely unconnected with his harmonica-playing (everyone’s a critic!) took up most of Act 1 of the two-part story, the majority of this episode is spent in London the company of our favourite loquacious theatre manager, as he fends off a fiend with a friend, racing through the stews and streets of Victorian London pursued by a bug that just begs to be CGId into existence. Now, here’s where things get complicated. George Litefoot’s on Minos at exactly the same time as Jago’s running through London. Litefoot’s running with the Doctor. We know of course that the whole ‘My Tardis is a good five minutes’ walk from here’ routine has been used before to explain why the Doctor, any Doctor, can be in a zillion places at what is precisely the same time – or indeed a zillion times at what is exactly the same place. But what Barnes does in Act 2 of the Jago & Litefoot Revival is cleverer than that. More delicious than that. And really, when all is said and done, rather more poignant than that. And that’s all the clues you’re getting about that. What we’ll say in addition is that Barnes, more than Benjamin or Baxter (Jago and Litefoot respectively), has a great ear for dialogue, and brings it to play here to allow both our eminent Victorians a unique Doctoral experience at one and the same time. With Jago and his version of the Doctor, there are rather more verbal tics to clue us in to the character’s personality, allowing Jago to recount for us his experience of meeting the Doctor at a very particular point in the Time Lord’s life, when, to be fair, being chased by a giant, scuttling CGI beastie more or less meant it was Thursday. Meanwhile, Litefoot’s Doctor, if anything, is even more pin-point in terms of the when and the how of his being on Minos – he gives us a callback to a TV line that will make every listener smile, to explain exactly when and how he comes to be on the island to lend a hand to his old friend Litefoot with a weapon probably a little more effective than an elephant gun. Perhaps the most extraordinary thing, despite the surprises in store for Jago and the punch in the hearts that Litefoot’s Act 2 storyline delivers, is the way in which the whole, more or less reasonable thing is resolved. That takes us from having two seemingly separate scenarios into having one scenario that harks back to a number of Seventh Doctor stories – there are elements of Battlefield in the scripting here, and elements of The Greatest Show In The Galaxy. Above all, what comes through is the character of the three leads, the Doctor, Jago and Litefoot, and how each of them is made significantly better, richer and fuller in character by knowing both the others, how, given any opportunity, they’d always go back for each other, stand up for each other, make unmakeable sacrifices for each other because each has proved their valour in the others’ eyes. It’s all rather moving, really. Whereas Act 1 was carefully balanced to advance one story to a crisis point and then bring the other forward to an earlier moment of peril, Act 2 is the headlong chase to conclusions of both strands, and especially to their entwined resolution, which is far less straightforward than either of the threats initially seem. But there’s still time for moments of quiet and moments of tenderness – Litefoot with his Doctor on Minos is particularly moving, but Jago’s Doctor is able to express a kind of intelligent regret that will seem familiar from the TV as soon as you hear it. What we end up with across the course of these two extraordinary Short Trips, is more or less a love letter, to classic Doctoring, modern Doctoring, and to the characters of Henry Gordon Jago and George Litefoot and the actors who give them life too. It’s everything you’d expect and want from a meeting between Jago, Litefoot and the Tenth Doctor – importantly short of David Tennant’s voice – and it’s actually rather more than that too, Big Finish proving it’s better at keeping its air-punchy spoilerific secrets a secret than the BBC is currently able to do. The Jago & Litefoot Revival might not win any awards. It won’t be the release of the year or anything so grand. But it is a couple of Short Trips that do more than they have to, proving the case for Doctorless Doctor Who for the New Who era just as the Companion Chronicles proved it for Classic Who, while delivering an hour of touching friendships, neat division of the world of Jago & Litefoot, and, as promised, a rejuvenation of both characters as they head into their thirteenth box set of adventures together.